When Sidhant Pai visited a local rubbish dump in his home city of Pune, India, he was struck by the size and intensity of the operation. Large black crows swooping overhead, roaming pigs, overwhelming odours and groups of waste pickers collecting plastic bottles in large white sacks. There are an estimated 15 million people globally who currently make their living from waste picking and many earn less than a dollar a day. A key problem, says environmental engineer Pai, is that workers only capture a tiny proportion of the value of the waste they collect, separate and transport to scrap dealers. Together with his parents, Suchismita and Jayant Pai, he founded social enterprise Protoprint in 2012, one of a number of organisations trying to address the twin issues of poor conditions for waste pickers and plastic waste pollution. More than 300m tonnes of plastic are produced globally every year, with much ending up in the ocean (one refuse truck’s worth every minute), in landfill, or on city streets. Protoprint partnered with SWaCH, a Pune-based cooperative wholly owned by waste pickers. Together they have set up a low-cost filament production facility at a local rubbish dump in Pune operated by SWaCH waste pickers to convert plastic waste – specifically high-density polyethylene (HPDE) mostly used for plastic bottles – into 3D printing filament to eventually be sold to Indian or international 3D printing companies. 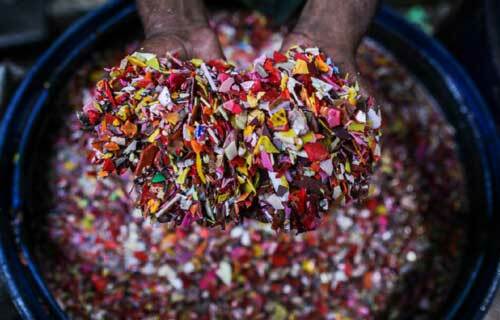 Protoprint buys filament from SwaCH for 300 rupees (£3.50) per kg – if waste pickers sold the plastic waste directly to scrap merchants the pickers would receive around 19 rupees (23p) per kg, says Pai. “After factoring in the costs of production and the various other expenses, there is still a six to eight times multiplier per kilogram of filament,” he says. The market for filament, the majority of which is made from virgin plastic, is growing rapidly. A report by a leading markets analyst predicted the 3D printing materials market would grow by nearly 266% over the next five years, to be worth £1.07bn by 2021. However, most of it is expensive because of production and export costs, says William Hoyle, CEO of TechforTrade. The British charity is working to promote and standardise an ethical way for filament to be made from the plastic collected by waste collectors. Ethical filament will be cheaper to buy than commercial filament, Hoyle says, because waste plastic is free resource and production costs are lower in developing countries. Amsterdam-based ReFlow, a social enterprise based in the Netherlands, works with one of TechforTrade’s printing partners in Tanzania, STICLab, on a pilot project in Dar es Salaam. Co-founder Jasper Middendorp compares the potential of 3D printing to the development of mobile banking or solar in Africa, both of which flourished because infrastructure was broken. “Tanzania is highly import dependent and has very little of its own production infrastructure,” he says, and 3D printing decentralises production without a huge capital expense or a great deal of specialised knowledge. This, he says, helps “make countries more self-sufficient instead of importing products from abroad that may not be suited to the local context”. The quality of the filament made from recycled waste plastic is a challenge for the whole 3D printing industry, says Pai. Protoprint’s pilot unit is currently making filament but is not yet ready to sell to market as there are problems with warping. The company is working with a team of senior polymer scientists from the National Chemical Laboratory to develop an additive for the filament to prevent the warping issue, funded by a government grant. Protoprint says it currently has 4,000kg of pre-orders, mostly from small- and medium-sized distributors based in the US, UK, Germany and India looking to sample and test the filament. “We have not yet started commercial operations and are working on improving our filament quality before we do so,” says Pai. Quality is not necessarily an insurmountable issue, says Thomas Birtchnell, a lecturer at the University of Wollongong and author of 3D Printing for Development in the Global South. Much of the recycled filament is destined for “the open source market for low-end products,” he says, “they may not look glamorous but they are still functional products that can be used in development contexts”.